Vimeo/SamaritasDanielle Koning, center, at her adoption hearing. Five-year-old Danielle Koning just got a magical surprise: On the day of her adoption hearing in Grand Rapids, Michigan, the courtroom was filled with Disney princesses. Jim and Sarah Koning were scheduled to adopt two children on June 8, WZZM reports. One of the children, Danielle, just happened to be obsessed with Disney. So Danielle’s case worker at Samaritas Foster Care Program and Child and Family Services asked a coworker to dress up as Cinderella for the hearing, according to a video created by Samaritas. 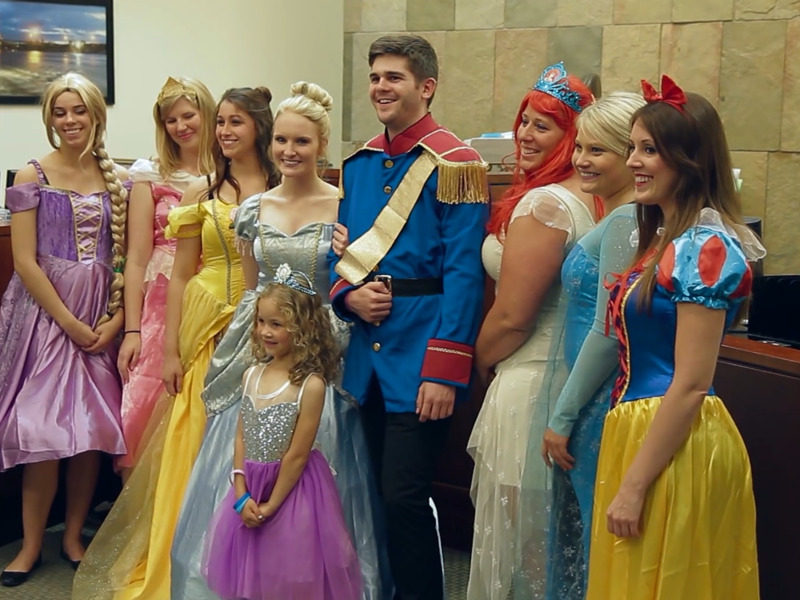 But word got out around the office, and soon, eight employees had agreed to attend the hearing as Disney characters. Even the judge took part, revealing a Snow White costume underneath her robe. She also invited Danielle up to the bench to bang the gavel once the adoption was made final.